Chlorine Dioxide must be generated on site and subsequently on site generating equipment must be used. WCS can provide a bespoke generator system to suit your requirements. Our generators are one of the safest and most reliable generators available for Chlorine Dioxide. WCS can provide equipment, chemicals and servicing requirements for all your water treatment needs. An initial in depth site survey will be carried out to determine feasibility and budget costs and a fully costed proposal shall be presented. Entire project management can be handled by WCS. Ongoing service, chemical delivery and technical support is provided with seamless integration for your Chlorine Dioxide application. Call one of our in-house specialists to discuss your Chlorine Dioxide requirements and arrange a free site visit. 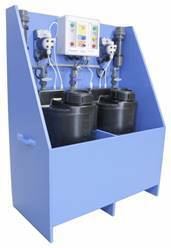 For additional information regarding Chlorine Dioxide Equipment please call us and ask for one of water treatment specialists.